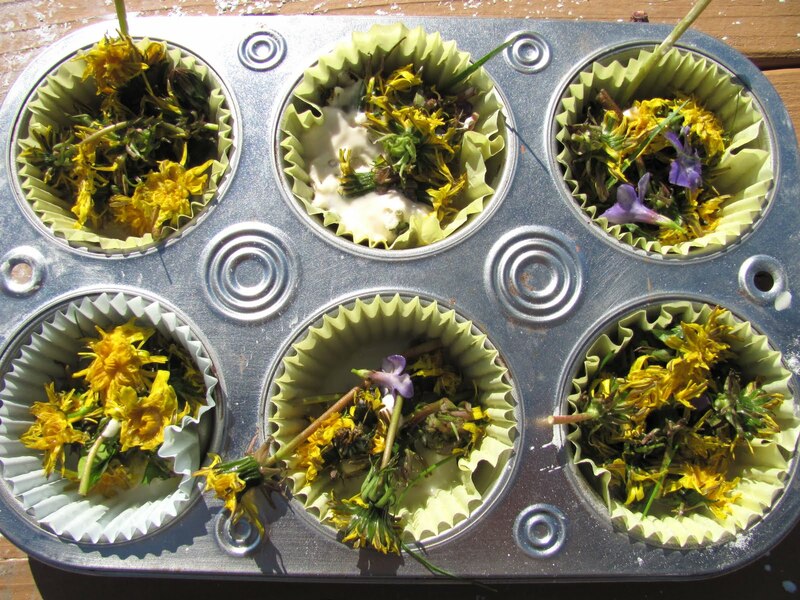 The Chocolate Muffin Tree: Dandelion Cupcakes! First we gathered all the flowers and grasses in our toy wheel barrow! Cassie Loves collecting natural objects and this activity in itself is valuable! One could create a nature collage with these materials too! These natural items that children collect are such precious treasures! This activity was so spontaneous that I ran into our house for muffin tins, liners, water, flour , corn starch, bowls, spoons, and measuring cups! Good thing we had most the ingredients and materials, but I'm sure you could use what ever you want! Cassie had no clue what was going on, but she was excited!!! I told her that we were making cupcakes and that she could use all the ingredients that I brought out to create a recipe that she wanted!!! She had so much fun and it was great to hear the conversation she was having with herself about making her cupcakes! Cassie especially loved the cornstarch! Cornstarch in itself is a great sensory experience! We put some on our hands and it was so fun to feel it and run our fingers through it! Cassie even put some cornstarch on our deck and smoothed it around and drew in it with her fingers! You can see that it got all over her face in the next picture! She could of kept making the mixture if I would have let her! After we mixed up the recipe, it was time to put the ingredients in the cupcake liners! Fun! What a Great creation! Cassie made two trays of her Dandelion Muffins! It made a huge mess, but it was easily sprayed away with the hose! She was so proud of her creation and wanted to show her Dad and anyone else that came by that day! Thanks again to: THE IMAGINATION TREE for inspiration! Please be sure to check out their post here! WHAT ARE YOUR FAVORITE PRETEND PLAY ACTIVITIES??? Well this is so creative! This creation is pretty, the yellows and purple against the white! 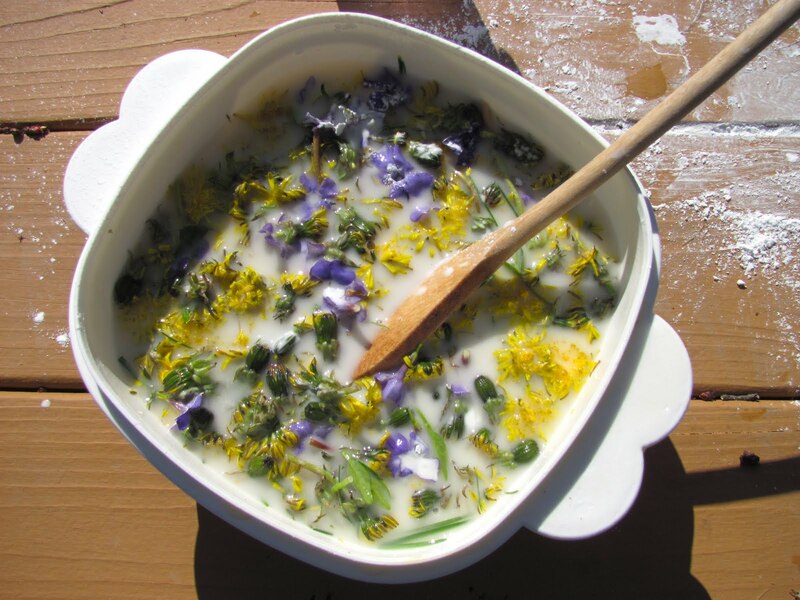 The sensory experience with flowers, fits right in with mud pies. This brings back childhood memories of mucking with flowers, leaves, and mud, and whatever. Children love this and can spend endless hours with this kind of play. I can't wait to do this with my children. My boys would really love this one! Thinking of making flower/flour pies. :) Thanks for the idea! Oooh lovely! No weeds here! Dandelion cakes son very much fun!! We made a dandelion crown, which looked pretty but didn't stay on long!